Check Point's latest firewall innovation brings the industry's strongest access control to organizations of all sizes. You can easily create access policies which combine capabilities of blades such as traditional FireWall, Application Control, Content Awareness, Mobile Access and more. 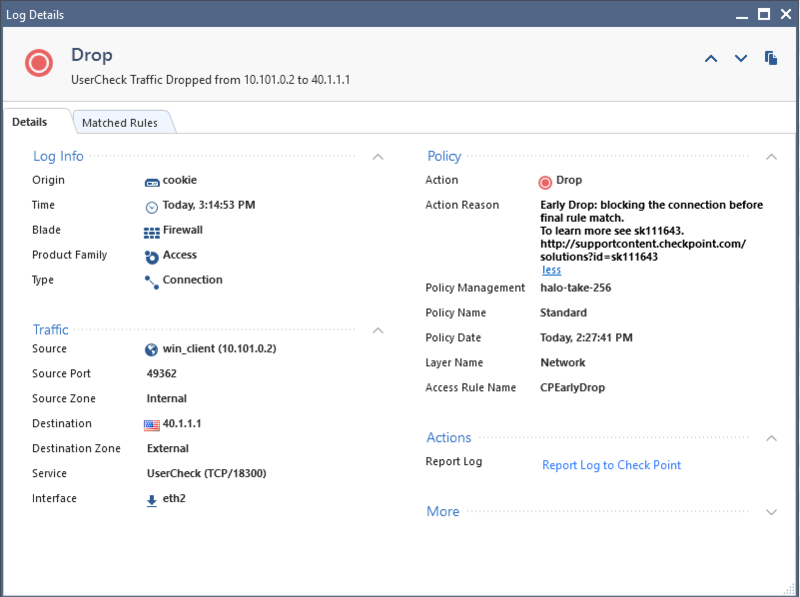 For information about Unified Policy, refer to the "Creating an Access Control Policy" section in the Next Generation Security Gateway R80.10 Guide. Blades (e.g: Application Control\Content Awareness) contain Classifiers that deal with traffic classification. Rule matching is done with the classification output. *Blades may have multiple Classifiers. Classifiers attach tag/object IDs to traffic. All Classifiers are implemented as CMI_LOADER applications. Saves rulebase matching state and classification objects (CLOBs). A Transaction represents one request-response. A Transaction contains classification collections objects (Observers) for special flags handling. A Connection (Unified Policy connection) contains Transactions. A Unified Policy Connection is stored in the Connection table. The Transaction is a Publisher. The Observer is a unit collecting CLOBs for classification refinement (e.g: CLOB dependency). Observers are registered to CLOB types (one-to-many). Responsible for the whole rule base execution process. First column (Usually destination) adds all rules matching its column to the possible rules list. Consecutive columns filter out all rules not matching their column from the possible rules list. When all columns have finished their matching, the first possible rule is the matched rule. In case CLOB type is not available, column will return with Need more data state until relevant CLOB type is available. Possible match is the status in which the rule base needs more data in order to finish matching. This means a "required for match" clob was not reported yet. How do we identify a Possible Match in the debug? Why did you get "Possible Match"? "column Destination returned need more data. Clob type 20 is not ready yet"
There is a table called "up_X_clob_type_scheme" for each sub policy (layer), where X is the layer id. These tables map a rule number to its "required for match" clobs and its active clobs. How do you know the sub policy (layer) id? The marked number is the sub policy (layer) id. In our case it is "0" (called "network" layer). In our example, at this point, inadequate information about "destination domain" was received (as shown above), and it is required for rule 3. That is the reason you could not "solve" the destination column and ended up with "Possible Match". What is early drop optimization? Dropping connection before there is a final rule match. It happens when all "possible rules for match" are DROP or REJECT. How do we identify early drop optimization in the Logs? How do you identify early drop optimization in the debug? Note: If the matching seems incorrect, you can turn on a global flag (called "up_log_reason_for_incomplete_match") which will add this reason in the log (if indeed the problem is related to this issue). How to identify match on implied rule? How do you know what rule 57 is? Each implied rule has this information block. Turn on basic debug (General section) and add more debug according to your policy and traffic. Do not forget to run usrchk debug off when done. Do not forget to unset all TDERROR when done.